DreamHack Leipzig, IEM Katowice qualifiers, LoL Open tour…Our teams had a lot of tournaments to play this weekend. The newly reformed League of Legends roster competed in its very first tournament. Stephano went to Leipzig, Germany, to take part in the first WCS stage of the season. He easily qualified through the first two group stages, but his group for the third stage was a tough one, including Scarlett, Namshar and Serral, the tournament winner. The player from Finland sent Stephano to the loser match against Scarlett for a very tense BO3. Unfortunately, Scarlett managed to defeat Stephano with a Mutalisk rush, which performed very efficiently in this Zerg versus Zerg match-up, whereas Stephano’s roaches were useless against flying units. His first LAN as a member of our team ended with a top 32, at the third group stage, very close to the playoffs. He is now focusing on the Olympic tournament of PyeongChang. Chinoize and Un33d are training and testing decks for the GamersOrigin Championship Series IV to be held from February, 3 to February, 4. During the weekend qualifier, Alkaige and OMjuwax managed to reach the final : they will take part in GOCS IV. As a sub on O’rigin, you can attend to the tournament and cheer for your favorite player. It is not too late to register: check your Twitch private messages. The Hearthstone players are also fighting on the ladder for a few more days, in order to end at a top position this month and to win their first HCT points. The PUBG roster took part in the qualifiers for Katowice, Poland, and the IEM. They reached the fourth group stage easily, obtaining a first place during the third group stage. They finished at the fourth position of the fourth group and qualified themselves for the closed qualifier, thank to an astonishing game of Fanom. A top 3 was required to qualify for Katowice, but they eventually reached the eleventh place. Despite disappointment, this performance is still notable regarding the considerable number of European teams that attended to the qualifiers – 908. The good form of the roster was instrumental in winning the Obsidius tournament a few days ago. Players will do their very best tonight during the Auzom Premier League, as every Monday. 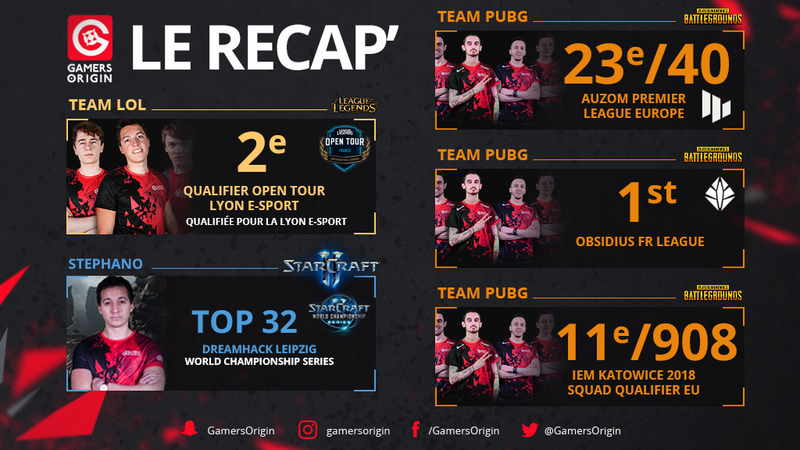 The League of Legends players played their first matches of the season during the LoL Open Tour Lyon Esport Qualifier. This first stop of the new Riot’s circuit granted the top 8 teams with an invitation for Lyon Esport, a seeding for the competition and points for the race to the new European tournament. GamersOrigin reached the final after winning against Solary and Gentside, then faced Vitality Academy. In the beginning of the game, GO’s botlane took 3 kills thanks to TynX’s move. The team led 5-0 after a few minutes. Despite an important gold amount and kills lead, GamersOrigin failed at the tail end. Vitality took the opportunity to come back and they finally won the game.